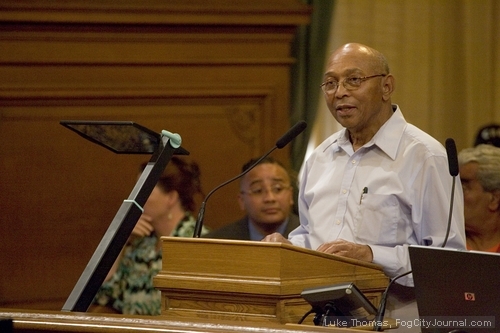 Last night, July 13, the SF Board of Supervisors held a 10-hour hearing on the Final Environmental Impact Report (FEIR) for Lennar’s proposed 10,000 unit condominium complex, stadium and green tech development at the Hunters Point Shipyard Superfund site and Candlestick Point. More than 200 Bayview residents and allies filled City Hall to demand that the Shipyard be FULLY cleaned before any redevelopment proposals are considered at the site. 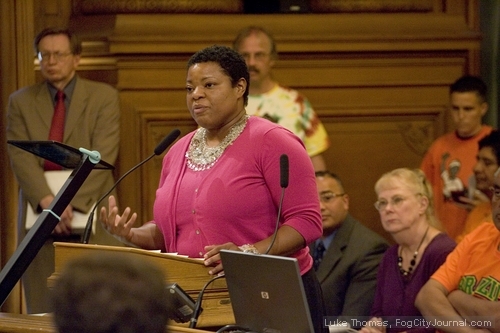 The hearing was a historic moment in the growing racial and environmental justice grassroots movement in San Francisco. The Supervisors voted to deny the appeal of the Final Environmental Impact Report that Wilma Subra and other leading scientists, national human rights lawyers and residents clearly demonstrated is inadequate, inaccurate and incomplete. The EIR passed with a 8-3 vote at the Board of Supervisors. The eight NO votes to deny the appeal of the EIR were cast by Supervisors Sean Elsbernd, Michela Alioto-Pier, Carmen Chu, Bevan Dufty, Sophie Maxwell, David Chiu, Ross Mirkarimi and David Campos. POWER and environmental justice allies thank and acknowledge the progressive Supervisors Eric Mar, John Avalos and Chris Daly who voted to oppose the EIR and endured incredible pressure from the opposition. We thank them for their principled integrity and their steadfast commitment to defend progressive values, environmental and racial justice. Labor Council leaders, the San Francisco Organizing Project (SFOP) and ACCE (formerly ACORN) have also allied with the Mayor’s Office and Lennar because they believe that the project will create jobs and community benefits. In our analysis, this vote by the Supervisors to accept the EIR opens the door for the community and workers to be exposed to toxic contamination at the Superfund site before cleanup is complete. In addition, the massive condominium development will further the crisis of African American displacement out of San Francisco. During the hearing, the Planning Department acknowledged that some the “below market rate” housing is set at such a high income level that it is actually ABOVE market rate. Our fight to influence the future of this massive development deal is far from over. The Lennar Corp. could face legal challenges if it moves forward the development project with a cover-up, not a full cleanup. POWER is building relationships with progressive planners who can help to advance development projects which serve the Bayview community. Stay tuned for actions soon to follow! It was really helpful that you are sharing this details to your readers, I do personally having a worth while in the article. Thanks for sharing such good release. Classifications of Computer – A computer is a machine that provides us information of various types when we need. We can hardly imagine our lives without computers; students, business, industries, corporate companies, scientific research centers, even a trespasser is having a computer for multiple tasks.